Star SM-T400i - Thermal, 4" Width, Tear bar, Bluetooth and Serial Interface. MFi Certified. Includes AC Adapter, Battery, Serial Cable, Belt Clip, Sample Paper Roll, and Setup Sheet. Works with Apple iOS (iPad, iPhone, iPod) and Android. Also known as SM-T400I-DB50. The SM-T400i portable receipt printer is approved by Apple, Inc. through MFi certification for use with the iPod Touch, iPhone and iPad. In addition to its ability to pair with iOS, Android and other popular mobile platforms, the SM-T400i has easy drop in & print paper loading, a reliable and quick print speed of 80 mm per second, and an intuitive LCD display. MOBILE PRINTER, BATTERY HOLDER T4, BATTERY CHARGER (1 BAY CRADLE) FOR SM-T400I. Also known as Battery Charger T4. 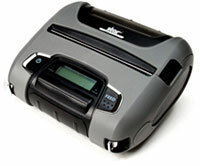 MOBILE PRINTER, BATTERY PACK T4, SPARE BATTERY FOR SM-T400I MOBILE PRINTERS. Also known as Battery Pack T4. Paper SM-T400I: 112 mm Width, 80 ft. Length, 1 roll, Blue Core, single roll. The Star 39631610 is also known as Star Micronics	STA-39631610	.